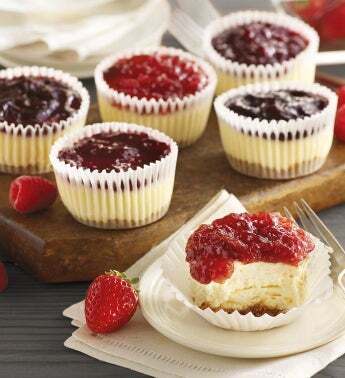 Enjoy half a dozen luxuriously rich and fruity, Cheesecake Cupcakes—provided here in a collection of three delightful flavors. We start with a sweet graham cracker crust, top it with velvety New York-style cheesecake, and finally hand-decorate it with a layer of raspberry, Bing cherry, or strawberry topping. We suggest pairing this mouthwatering dessert with robust coffee or a light fruity beverage.